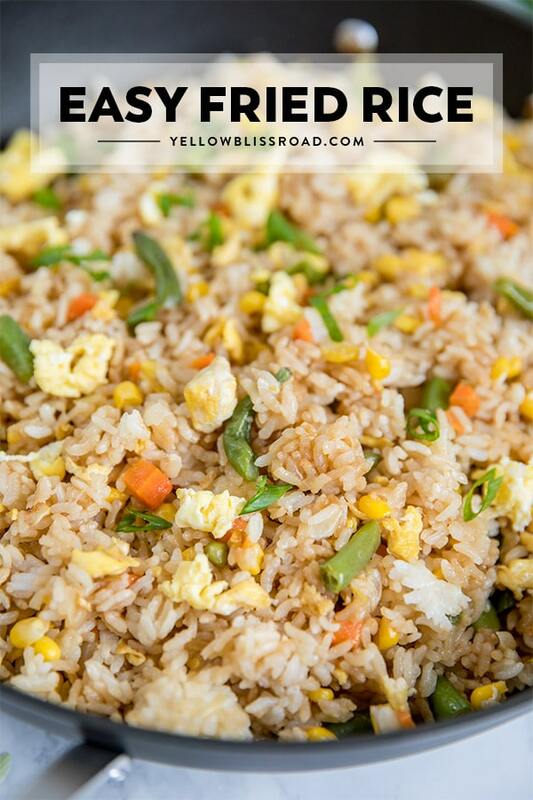 Learn how to make Fried Rice the easy way with this simple Egg Fried Rice Recipe. Made with just a few ingredients and packed with flavor, this dinner is about to become your new favorite. This recipe can be a complete meal in itself because it’s got protein, veggies and carbs all built in! 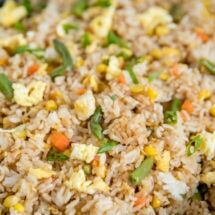 However, we do like to serve fried rice with Asian inspired dinners like Crockpot Orange Chicken or Honey Lemon Chicken and Green Beans Stir Fry. This recipe is a family favorite. I love it because it’s simple to make with ingredients I always have on hand and it’s incredibly easy to customize. My family loves it because it’s absolutely delicious! I make fried rice at least once every few weeks, sometimes with scrambled egg, and sometimes I add chicken, pork or even bacon! I have been making this rice recipe since the first time I watched a Teppanyaki chef cook it in front of me at a local restaurant 20 years ago. Yes, I learned how to make Fried Rice from Benihana. Don’t judge, because it’s seriously the best thing ever. When I say simple, I mean, seriously as simple as it gets! Add a bit more oil or butter to the skillet and saute some onions. I like to keep my onions diced pretty small for fried rice so my kids don’t have to pick them out, because they can’t even see them. Let the onions cook until they’re soft; about 3 minutes. Add some thawed frozen veggies and some minced garlic to the pan. Heck you could even toss them in frozen. I add some butter at this point because it just helps to flavor the veggies. You could easily swap the frozen for fresh, or add things like bok choy, broccoli or bean sprouts. Add cold rice to the skillet and stir it with a flat wood spatula. Once the rice is heated through you can add soy sauce and sesame seeds until you love the flavor, then serve right away. DOES THE RICE HAVE TO BE COLD? Chilled rice is better than hot because it’s had time to dry out a bit. Hot rice equals a mushy mess if you try to fry it right away. If you don’t have any on hand go ahead and cook the rice in a rice cooker and spread it out on a rimmed baking sheet then pop it in the fridge. 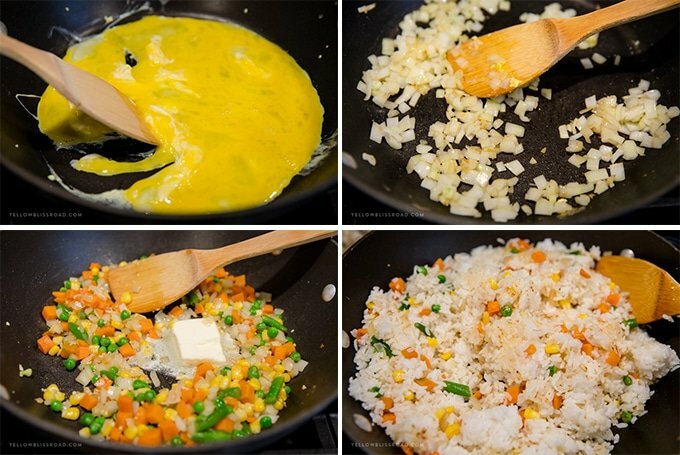 In about 30 minutes you’ll have perfect chilled rice that you can fry right up. Depends what you add to it! 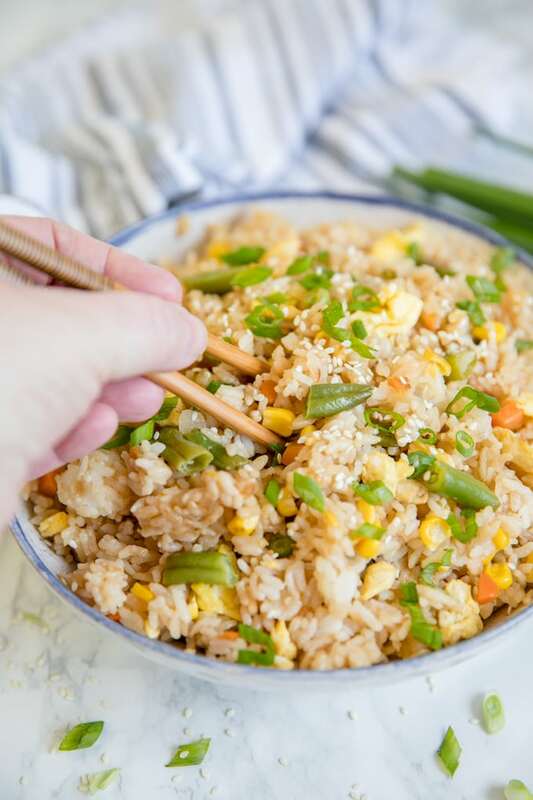 Fried Rice is basically a cooked rice that’s been fried in oil and the amount of oil that you use can determine how healthy or unhealthy the recipe is. Adding a protein like egg and lots of vegetables can increase the nutritional value. 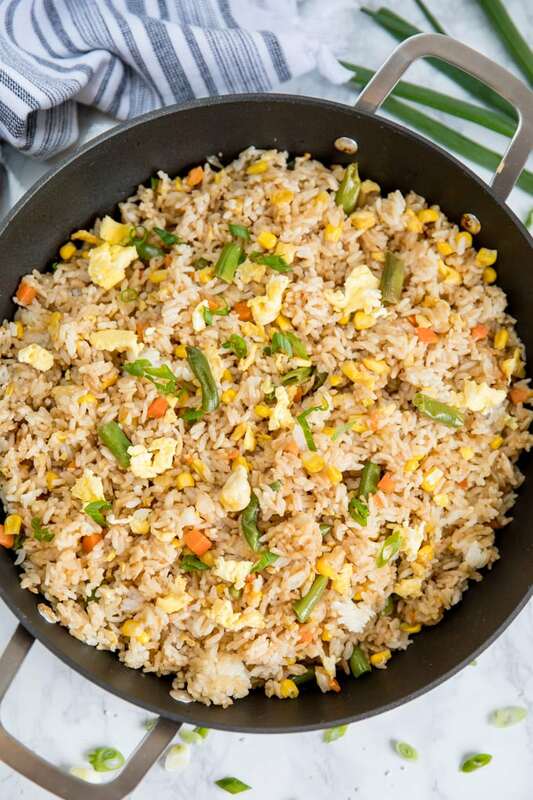 CAN YOU REHEAT FRIED RICE? I think this rice is even better the next day! Make sure to refrigerate the rice as soon as possible after serving, and store it in an sealed, airtight container. 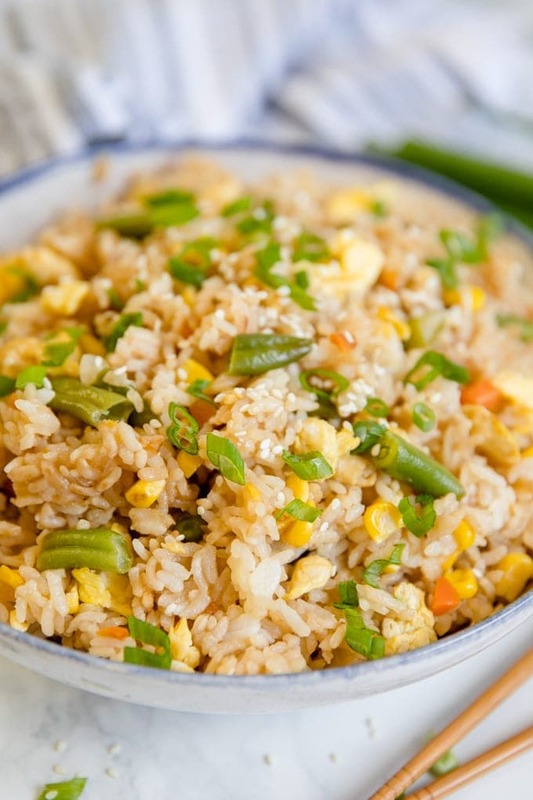 To reheat fried rice, microwave on high until it’s piping hot, stirring a few times. You can also reheat in a skillet on the stove with a little bit of olive oil or butter. Add another tablespoon of olive oil to the skillet. Add onion and cook until translucent; about 2 minutes, stirring often to avoid burning. Stir in garlic, then add frozen vegetables and cook until heated through. Season with a pinch of salt. Return the egg to the skillet and stir to heat through. Use any veggies you like; fresh instead of frozen, broccoli, bok choy, bean sprouts, etc. Use any protein you like; chicken, pork, bacon, etc. This easy stor fry was amazing!! I enjoyed making it and eating it. I had to cut the recipe in half because I’m only serving for two. I had about two scoops and my husband finished the rest. He was So full and satisfied. Thank you Krystal! So happy that you and your husband loved this recipe!